In the 1950s, IBM programmer John Backus invented a programming language called Fortran. It's still in use today, and here's what you need to know about it. Fortran: Where general-purpose programming began. The list of high-tech tools in continuous use since the early 1950s isn't very long: the Fender Telecaster, the B-52, and Fortran. 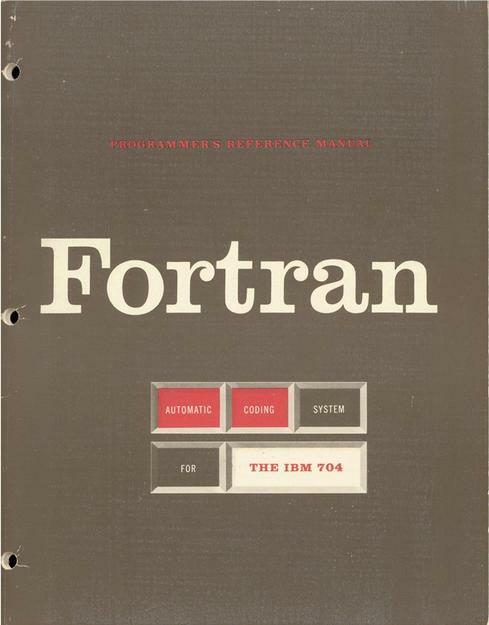 Fortran (which started life as FORTRAN, or FORmula TRANslator) was first created by IBM programmer John Backus in 1950. By the time John F. Kennedy was inaugurated, FORTRAN III had been released and FORTRAN had the features with which it would become the predominant programming language for scientific and engineering applications. To a nontrivial extent, it still is. Whereas COBOL was created to be a general purpose language that worked well for creating applications for business and government purposes in which reports and human-readable output were key, FORTRAN was all about manipulating numbers and numeric data structures. Its numeric capabilities meant that Fortran was the language of choice for the first generation of high-performance computers and remained the primary development tool for supercomputers: Platform-specific versions of the language power applications on supercomputers from Burroughs, Cray, IBM, and other vendors. Of course, if the strength of Fortran was in the power of its mathematical processing, its weakness was actually getting data into and out of the program. Many Fortran programmers have horror stories to tell, most centering upon the "FORMAT" statement that serves as the basis of input and output. While many scientific applications have begun to move to C++, Java, and other modern languages because of the wide availability of both function libraries and programming talent, Fortran remains an active part of the engineering and scientific software development world. So how can you get your hands on Fortran? It's actually pretty easy. This isn't an exhaustive list of all the Fortran compilers in the world, but rather a survey of some of the packages easily available to those who want to learn the language or use it in their own projects (plus a couple that you're likely to run into if you land that Fortran programming job you're hoping for). If you're looking for a programming language in use on everything from $25 computers that fit in the palm of your hand to the largest computers on earth you only have a couple of choices. If you want that programming language to be the same one your grandparents might have used when they were beginning his or her career, then there's only one option. Welcome to Fortran, the once and future language of scientific computing. Our tour starts on the next page. Let me know which packages I left out and how you're still using the Fortran skills you learned "back in the day." If you can do that while using a FORMAT statement, everyone here will be impressed. Really. Then where are the Fortran jobs at? I know Fortran. But where are the Fortran jobs at? why not to use fortran?? and its develop every year and why not to use this languages.!! I took Fortran IV from Dr. Vickers at UF back in 69-70-71 (I don't recall for sure exactly when it was) - I just doing a Googe search on Fortran IV and found these posts, which brought back memories from back then. The "computer" was actually an entire 4 story building (as I recall) with the mainframes in the basement, the keypunch operators on the first floor, programers on the second floor, and the magnetic tape storage units on the third floor. The exciting thing at the time was the changing from copper wiring to optical fiber because "light travels faster than electricity" and as those distances (main frames-to-magnetic tape-and-back) it was a super big deal. Just remembering 'back when', thanks. I learned FORTRAN 77 and FORTRAN IV(WATFIV, the successor to WATFOR which was short for Waterloo University Fortran) in a progarmming at Brooklyn College and later in one at Baruch College, both part of City University of New York. I remember that I also found the FORMAT statement cumbersome and that PL/1 and COBOL were much better at handling I/O. I remember long turn around times near midterms and finals and both card readers and keypunch machines mangling cards and keypunch machines running out of ribbon ink so that you had to read the hole punches. I have other not so fond memories of dropping card decks and trying to put them back in order and also waiting a long while to find out that one punctuation mark was out of place. I also used PL/1(an IBM programming language that reminded me of a cross between COBOL and FORTRAN) on cards with the same frustrating experiences. Both colleges used the central CUNY IBM 360/370 mainframe and required cards with IBM JCL(Job Control Language), which I eventually mastered, before and after the code. Switching later to a terminal I rented at home (a Zenith with a 300 baud modem) and to the terminals at the school, I felt liberated from cards; even with long wait times and slow response times they were much easier to deal with. I aslo used COBOL with JCL for two Business Applications courses on a terminal. Later I bought my own PC to use for the same purpose. After school, I only used mainframes for submitting SAS statistics jobs, interfacing with an agency ADABAS database for use with kisok and IVRs, and to retreive info to download to PC networked database systems. Using PCs now, even to access mainframe data through terminal emulation or a web interface, I am much happier. Though I have occaisonally used minicomputers(DEC, BASIC 4, IBM System 36 and AS/400) which came with their own JCL and challenges, none were quite like using FORTRAN on punch cards. Now, I am a Salesforce progarmmer since we switched from AccessVBA and Visual Basic .NET a few years ago. In 1997 our company had a project that required Lagranian Dispersion of sulfur dioxide emissions using a model called CALPUFF. This model treats the emissions as a series of puffs that advect and disperse through the gridded network. The only PC architecture able to handle this work at that time was the DEC Alpha. I had four 500 Mhz and one 525 Mhz Alpha machines running Win NT4. You could run x86 apps through an emulator. The Alpha with the emulation software was still about twice the speed of a x86 PC available at that time. DEC FORTRAN was used. The four Alpha machines could run a full month of meteorological data and emissions in a week. So, it took us three months to run the full one year of meteorological data. The four 500 Mhz machines were connected through a KVM switch to the monitor, keyboard and mouse. The system worked great but with the four machines on the same desk, the room could get very warm. Corel released native WordPerfect and CorelDRAW versions for Win NT4 on the Alpha. AutoCAD 12 ran very fast in the emulation mode. I was fully committed to the Alpha architecture until in October 1999, Microsoft dropped software support for the machine. Win 2000 for the Alpha was out in beta mode. I had it running on the 525 Mhz machine by setting the clock back so the software would not expire. With no Windows upgrade future for the machines,I ran them off the network as FORTRAN workhorses until 2003. By then the AMD x86 multi-core machines were faster than the single-core Alpha and a whole lot cheaper. Yes, the DEC Alpha was a great architecture. HP did not embrace it, so it died. Curt - in 1969 at Florida Atlantic we had to get a prof to give us access if we wanted a priority run. There was no charge to students. A few of us would go to the batch submit room and prep our JCL and FORTRAN code cards. Since we had no priority, we were moved to the end of the basket of submitted cards (wrapped in rubber bands). Once the tech got to know you, he would sneak in an extra run if you were quick enough to correct your mistake(s) and get the cards back into the loop before the submit window closed. So, on a good day you could get as many as four runs on the IBM 360. - scarred me for life; I still can't deal with object-oriented paradigms. You replied, "the fact that More and More Developers would introduce their own flavors of Fortran today and in the future we will see different-different companies,etc using different Forks of Fortran(similar to Linux/Android) which suits their specific needs here." Please note I meant to convey the very opposite of what you have stated: note my comments such as "its usage will become more standards-based (note few vendors now introduce their own language extensions) which will allow more portable code." What is happening in the world of Fortran is NOT fragmentation that is negatively impacting Linux/Android, hampering their advance in the enterprise arena. Largely, the Fortran implementations (compiler vendors, etc.) are coming together with a standards based approach. Fortran language development is well and alive under Fortran Working Group (ISO/IEC JTC1/SC22/WG5), a standards body. Many fellow coders in Fortran are now begiining to apply "/stand" compiler option to flag code elements that may be non-standard, often due to language legacy. I've read up until the 1990s the compiler vendors would actively introduce their own extensions in the language to support their customers, a practice that did lead to fragmentation but which has become unpopular now. In our code, all the non-standard aspects have been eliminated and the code is now portable across compilers and platforms/OSs. Great points and really-really appreciate your Detailed Explaination here! This is what's the greatest part about Informationweek today. We have so many Diverse viewpoints with varied Experiences that one can learn a lot from each and everyone of them! I had an inkling that your answers would be along these lines and especially the fact that More and More Developers would introduce their own flavors of Fortran today and in the future we will see different-different companies,etc using different Forks of Fortran(similar to Linux/Android) which suits their specific needs here. Please keep contributing to this website with your Unique insight and experiences here.